Service animals who assist people with disabilities are allowed in Red Cross shelters. It may be difficult, to find shelter for your animals in the midst of a disaster, so plan ahead. Do not wait until disaster strikes to do your research. Many communities are developing pet friendly shelter plans, check to see if your local emergency shelter plan include pets. Contact hotels and motels outside your immediate area to check policies on accepting pets and restrictions on number, size, and species. Ask if "no pet" policies could be waived in an emergency. Keep a list of "pet friendly" places, including phone numbers, with other disaster information and supplies. If you have notice of an impending disaster, call ahead for reservations. 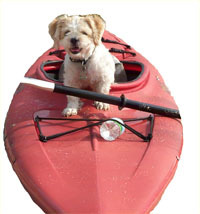 Go to Pet's Welcome to search online for pet friendly hotels and motels. Tobey the Wonder dog has his plan, do your pets have theirs?